A favorite snack for students in Scotland is a deep-fried Mars Bar. This sounds disgusting, and very fattening...I can't imagine eating one. But I bet a fresh one is nicely melted just like the chocolate on a smore'. 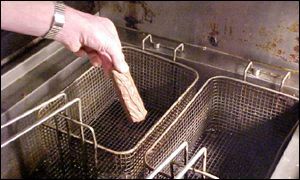 Supposedly this is popular to deep fry already unhealthy food; like pizza or Cadbury Eggs. Well, I am curious if this trend will catch on here.